With apologies, I've been battling a flu bug that has had me foggy headed and in bed for the last five days, this is my first post in a while, but its big news on several fronts. Sandy Koufax and Hank Aaron are confirmed signers for 2011 Topps Baseball releases. 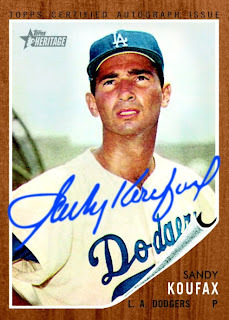 As you remember, Koufax was announced and then mysterious pulled a day later, but can now be confirmed along with Aaron to do on card signatures for 2011 releases. Both Koufax and Aaron are not big signers so this is great news for collectors and a sign of things to come for the 60th Anniversary of Topps Baseball. 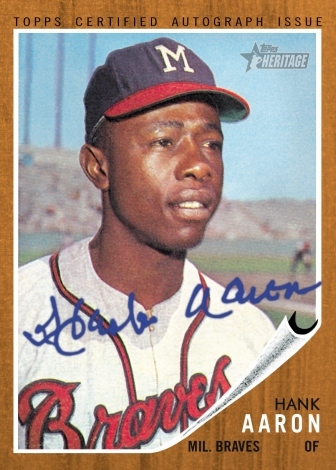 Both will appear in 2011 Topps Heritage and in the new Gypsy Queen release which will be modeled after the 1887 N174 Gypsy Queen baseball cards.